Movistar Yamaha MotoGP riders Jorge Lorenzo and Valentino Rossi gave a brilliant performance at the Gran Premio de la Comunitat Valenciana, to bring Yamaha’s Factory Team the 2016 FIM MotoGP Team Title. The Team arrived at the Circuito de la Comunitat Valenciana Ricardo Tormo with one goal in mind: secure the Team’s Title for the second year in succession. After the triple-header overseas, Rossi and Lorenzo arrived back on European soil feeling confident that they could put up a strong fight. 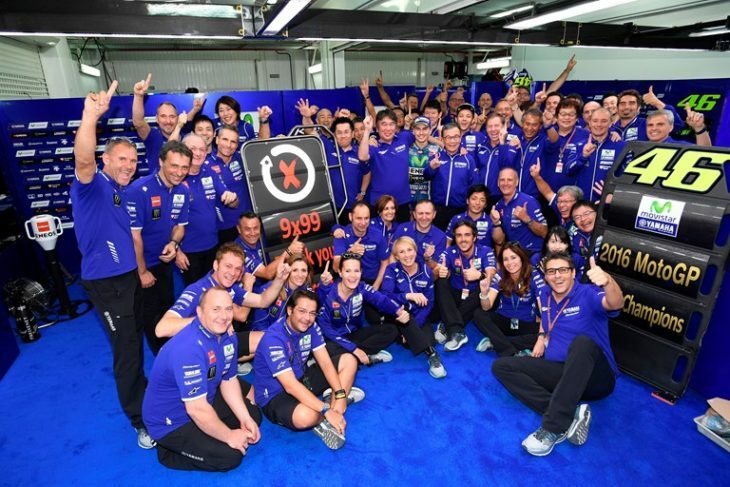 Highlights of the first 17 rounds of the 2016 season saw the blue team secure five Grand Prix victories (three by Lorenzo and two by Rossi), a total of 19 podiums (ten by Rossi and nine by Lorenzo, including five double podiums), and two consecutive perfect 45-point scores (first and second place) at the Gran Premio de España (Circuito de Jerez, Spain) and the Grand Prix de France (Le Mans, France). Thanks to their consistent high placements and continued strong pace, the Movistar Yamaha MotoGP team arrived to the last round of the season with a comfortable ten points advantage over their main rivals in the Team standings. Lorenzo and Rossi further ensured their chances of giving Yamaha the Team’s Title by positioning their YZR-M1 bikes on first and third place on the grid for the final race in Saturday’s qualifying, giving them a small edge over their competition. Starting the last race of the season from a perfect position, Lorenzo and Rossi gave a flawless performance during the 30-lap race and signed off the MotoGP World Championship with a first and fourth place respectively to secure the 7th Team Title for Yamaha (since it was added in 2002). The Team effort displayed at the final round is the ideal closure for Lorenzo’s nine-year long career with the Yamaha Factory Racing Team and Yamaha, seven of which were spent with Rossi as his teammate.